Our tour of “blue state” Inaugural cheeses has plenty of fodder in the New England states, and Vermont’s Jasper Hill Farm appears four times on the Wine Spectator list. 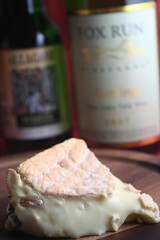 Today’s cheese, Winnimere, is a washed-rind stinky cheese whose funky outer appearance may intimidate the uninitiated. The pink crusted round is wrapped in dark spruce bark, which imparts a woodsy flavor. Inside the salty crust, the cheese is creamy, yeasty and tangy with a subtle fruity sweetness from the raspberry lambic-style beer the cheese is rinsed in. In keeping with their strict pursuit of quality, the spruce bark and beer are obtained from Jasper Hill’s own trees and yeasts. I enjoyed the Winnimere paired with Allagash White Ale from Maine and Fox Run‘s Riesling from New York’s Finger Lakes region. You could also try it with a Dogfish Head Midas Touch from the Vice President-elect’s home state of Delaware. 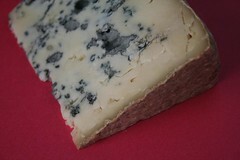 Winnimere is only available November to April, and I found it in stock at the District’s Cowgirl Creamery. 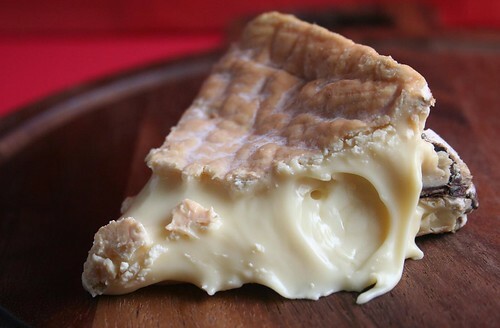 To learn more about washed-rind cheeses, read this week’s Cheesemonger column at The Kitchn. And tune in tomorrow when our Inaugural cheese tour heads West!